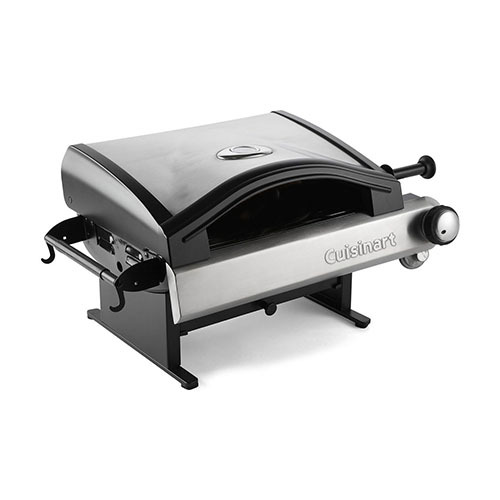 The Cuisinart CPO-600 is an outdoor pizza oven that is perfect for home grilling, camping or even tailgaiting. This compact outdoor pizza oven is made from solid stainless steel and ergonomic lid handle for one hand lifting. A combination of reflection, convection, and conduction heat makes the most out of the 15,000 BTU output, cooking pizzas perfectly in as little as five minutes. The oven works with standard liquid propane fuel tanks. A smoker-chip cup allows to add wood-chips to control the flavor of your crust. A 13-inch diameter pizza stone and 12-inch pizza peels are included along with a guide to using the oven for best results. The Cuisinart Outdoor Pizza Oven With Accessories has many exciting features for users of all types. You can extend the lifetime of your Cuisinart Outdoor Pizza Oven With Accessories with the purchase of a FactoryOutletStore Factory Protection Plan. 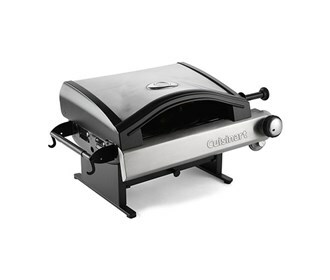 See the Cuisinart Outdoor Pizza Oven With Accessories gallery images above for more product views. The Cuisinart Outdoor Pizza Oven With Accessories is sold as a Brand New Unopened Item.